That question seems to be one of the most hot-button topics in digital marketing today. Most likely because finding the answer is so challenging thanks to numerous channels, media mixes, and multiple devices. And there doesn’t seem to be one right answer when it comes to measuring effectiveness, though campaign results are crucial in determining future advertising strategy, where to put more money, and how to expand on successful messaging. To truly understand the impact of a campaign, marketers need to be able to dig into results at an individual level through first-party data. Research Now, an online market research company, and Econsultancy, a subscription-based service that gives marketers access to research, market data, best practice guides, case studies and e-learning, teamed up to survey 2,715 global marketers to examine their approach to measuring the effectiveness of campaigns. The sample consists of client-side/in-house marketers, agencies, independent marketing consultants, and technology vendors. 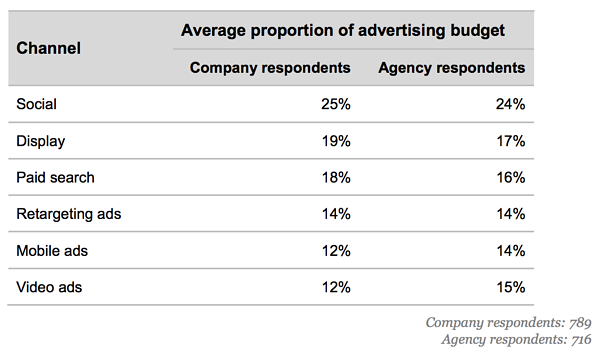 More than three-quarters (77%) of company respondents agree that the success of advertising should drive the level of budget allocated to it. The ease of digital measurement, alongside this attitude, is reflected in the results; brands allocate 25% of their budget, on average, to digital, compared to 13% to TV, which tends to be a more difficult channel to measure. 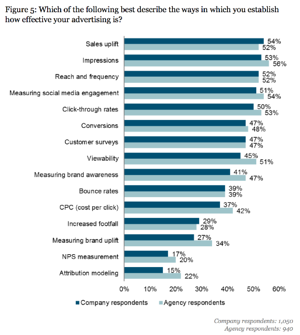 Those who are effective at advertising measurement are more likely to be using key measurement tools. Over two-thirds (69%) of marketers who are ‘extremely effective’ at digital advertising use customer surveys, and 74% measure brand awareness, compared to 21% of those who are ineffective at measuring each of those. 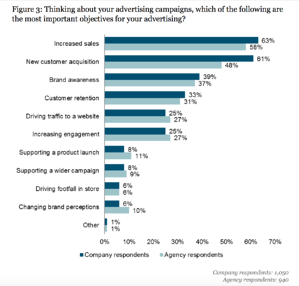 More than 60% of client-side marketers agree that ‘surveys to test advertising effectiveness provide a strong indication of the success of an advertising campaign,’ and 54% agree that these surveys are essential to advertising validation. An even higher proportion (72%) see market research as playing an important part in measuring the effectiveness of advertising. The outcome of a campaign isn’t going to mean anything if it wasn’t set up correctly in the first place. Avoid any arguments and discussion after the fact by getting all key players to understand and agree on the campaign’s objectives and subsequent results tied to those goals from the very beginning. He suggests dividing every activity into a separate role as it relates to the customer journey, with each assigned a KPI. When asked how they measure the above, respondents said proof of increased sales was the top indicator (66%), traffic second (62%), and social media engagement and increased brand awareness third (45% each). The report cites an eMarketer prediction that American adults this year “will spend almost six hours per day using digital media, including mobiles, desktop/laptops, and other connected devices.” All those channels (and time) provide a lot of opportunity for marketers to get their messages to audiences, but with all those choices, where do you even start? As we talked about above, define your campaign objectives, and you’ll have a better idea of the media mix to include in your strategy. And don’t put all your eggs in one basket. More marketers are shifting budget to digital thanks to viral potential, low costs, and relatively easy measurement, but TV and video shouldn’t be ignored, especially if you’re focused on long-term effects like brand awareness. The IPA, a UK organization for professionals in advertising and marketing communications, found in a study that adding TV to a media mix (in addition to channels like Facebook), can increase campaign effectiveness by 40%. Applying the above findings to your strategy, diversify budget across a media mix that makes sense for your campaign objectives. You’ll get the most data and bang for your buck from multi-channel campaigns. Don’t get overwhelmed by the number of marketing channels available. Instead, test quickly to determine which are right for your brand and strategy. Media mix choices will only continue to grow. The faster you can understand and implement, or ignore new channels, the more ahead of the game you’ll be. The most effective marketers see the wide range of marketing channels as an opportunity, not a burden. Correctly attributing a purchasing decision often requires tons of clean data, which takes a lot of time and skill to establish and maintain – luxuries many businesses don’t have in-house. Of respondents in the survey, only 15% of in-house staff say they use attribution modeling to determine a campaign’s success, with that number rising to just 22% for agencies. So if you’re looking for quick and solid feedback on your campaign, consider these avenues first. You’ll also want to prioritize the measurement techniques that are easiest for you to set up and manage. Don’t shoot yourself in the foot by trying to create a complicated attribution model that might not be correct from the beginning. Check out our post on solving attribution issues for some tips on how to get started. Be sure to checkout our Q1'18 social media advertising benchmark report for the latest CPM, CPC, and CTR trends.